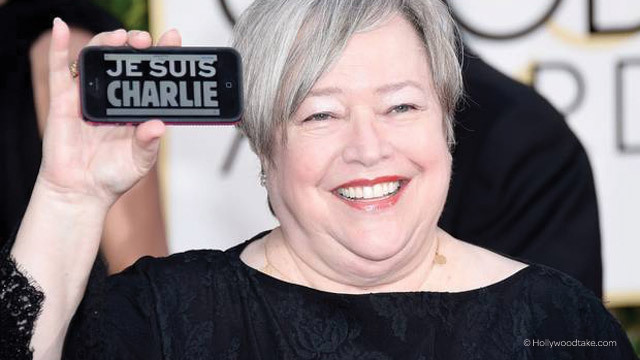 There she is: Kathy Bates strutting down the red carpet and flashing her CandyShell for iPhone 5, with a powerful message that’s been sweeping social media across the world: Je Suis Charlie. Bates received applause and attention not only for her support of free speech in light of the Charlie Hebdo attacks, but for screaming out in pain when somebody had stepped on her foot mid-walk. Other news from the 2015 Golden Globes included Tina Fey and Amy Poehler’s irresistible chemistry and, to be expected, uncomfortable political jokes. See what Time Magazine had to say about the socio-political commentary on stage, or head over to E! Online for a more award-centered recap.